For other uses, see John Oxley (disambiguation). John Oxley was born at Kirkham Abbey near Westow in Yorkshire, Great Britain. He was baptised at Bulmer on 6 July 1784, his parents recorded as John and Arabella Oxley. In 1799 (aged 15), he entered the Royal Navy as a midshipman on the Venerable (1784). He travelled to Australia in October 1802 as master's mate of the naval vessel Buffalo, which carried out coastal surveying (including the survey of Western Port), and this first stay in the Colonies would last for five years. In 1805 Governor King appointed him acting lieutenant in charge of the Buffalo. In 1806 (aged 22) he commanded the Estramina on a trip to Van Diemen's Land (now Tasmania). He returned to England in 1807 and from there he was appointed first lieutenant of HMS Porpoise, a British sloop of war that was stationed at NSW. To take up this appointment he sailed out again to NSW, traveling as agent for the Transport Board in the convict ship Speke, arriving in November 1808 and in which he shipped goods worth £800 as an investment. In 1809 Porpoise visited Van Diemen's Land, carrying as a passenger Governor William Bligh, who had been deposed in the Rum Rebellion. During the period in which he'd returned to England, Oxley had obtained an order from the Colonial Office for a land grant of 600 acres (240 ha) near the Nepean River, but Lieutenant-Governor Paterson granted him more - 1,000 acres (400 ha). Oxley had to surrender this land in 1810, (everyone given land grants since Bligh's deposing was required to surrender their land) but Governor Macquarie then granted him 600 acres (240 ha) near Camden which he increased in 1815 to 1,000 acres (400 ha) again. This he called 'Kirkham'. In 1810 he wrote a lengthy report on the settlements in Van Diemen's Land before returning again to England, in Porpoise, in May. Back in London he applied for the post of Naval Officer in Sydney, and then, after paying Charles Grimes to resign, according to John Macarthur, he twice sought the post of Surveyor-General. When Bligh was deposed, Oxley had denied that he had been a partisan of Macarthur, (Macarthur being ordered to England for court-martial) but his letters show that he was on very intimate terms with Macarthur, the leader of the anti-Bligh faction. In 1812 he became engaged to Elizabeth Macarthur, daughter of John Macarthur; this was broken off when her father discovered the extent of Oxley's debts. By that time, through the influence of Macarthur's friend Walter Davidson, Oxley's second application for the NSW surveyor-generalship had been successful. In 1811 he retired from the navy, and in May 1812 sailed for Sydney, for the third time, in the Minstrel to take up his new duties as Surveyor-General, even though he had no land mapping experience at all. Oxley's appointment was at the time of Lachlan Macquarie's Governorship. Macquarie encouraged exploration – he had sent George Evans to confirm the exploratory work of Wentworth, Blaxland and Lawson over the Blue Mountains, instigated the building of the road over the Blue Mountains in 1814-1815, and had travelled to Bathurst immediately William Cox had completed it. From there he had sent George Evans on an expedition of exploration up the Lachlan River in May 1815. Now Macquarie wanted the Lachlan and Macquarie River explored thoroughly. Opening up of the new lands over the mountains had created enthusiasm for further discoveries about them and the Macquarie River. Mysteriously, the Macquarie, and the Lachlan, discovered by Evans in 1815, flowed westwards to the interior of the country and not easterly towards the coastline. Successively, in 1817 and 1818 Governor Macquarie appointed John Oxley in charge of two expeditions to investigate these rivers. On the 1817 Lachlan expedition, Oxley was to come across marshy country and conclude this inland area was uninhabitable. If he had pressed on for two more days he would have reached the Murrumbidgee River. Oxley reported that, in his opinion, the Lachlan flowed into an extensive series of swamps, "which were, perhaps, the margin of a great inland sea." Similarly, the Macquarie expedition the following year in 1818 came to a halt on that river at the Macquarie Marshes in a good season for the marshes as the Macquarie was in flood replenishing these vital wetlands. Oxley tried hard to proceed through them but couldn't do so. He returned to the encampment of the rest of his party now convinced that these westward flowing rivers terminated in an inland sea, and he had been on the swampy edge of it. In March 1817 John Oxley was instructed to take charge of an expedition to explore and survey the course of the Lachlan River. He left Sydney on 6 April 1817 with George Evans as second-in-command, and Allan Cunningham as botanist. The previous year, Evans had accompanied Macquarie over the Blue Mountains to Bathurst on the celebratory completion of Cox's road, where Macquarie had directed him on an exploratory journey which resulted in Evans reaching and naming the Lachlan River west of Bathurst in May 1815. Oxley's party reached Bathurst after a week, where they were briefly detained by bad weather. On 25 April 1817, they reached the Lachlan River Depot which had been prepared for them (with provisions and supplies) in advance by a separate party under the direction of William Cox. From here, they commenced to follow its course, with part of the stores being conveyed in boats. As the exploring party travelled westward the country surrounding the rising river was found to be increasingly inundated. On 12 May, west of the present township of Forbes, they found their progress impeded by an extensive marsh. They travelled down a northern branch of the river to Mt Mulguthery where they were forced to return up the river. After retracing their route for a short distance they then proceeded in a south-westerly direction through Ungarie and past Weethalle, intending to travel overland to the southern Australian coastline. By the end of May the party found themselves in a dry scrubby country north east of Yenda where they ascended several peaks in the Cocoparra National Park. Shortage of water and the death of two horses forced Oxley's return, passing near Rankins Springs to the Lachlan River. On 23 June the Lachlan River near Merrigal Bridge was reached: "we suddenly came upon the banks of the river… which we had quitted nearly five weeks before". They followed the course of the Lachlan River through Hillston and Booligal for a fortnight. The party encountered much flooded country, and reached a point 5 km south west of Booligal which was their last camp site. On 7 July Oxley proceeded another 16 km along the flooded river and recorded that "it was with infinite regret and pain that I was forced to come to the conclusion, that the interior of this vast country is a marsh and uninhabitable". Oxley resolved to turn back and after resting for two days the exploring party began to retrace their steps along the Lachlan River. They left the Lachlan at Kiacatoo up-stream of the present site of Lake Cargelligo and crossed to the Bogan River and then across to the Wellington Valley on the upper waters of the Macquarie River, which they followed back to Bathurst (arriving on 29 August 1817). The Wellington Valley would later be made the site of a convict settlement mostly for convict 'specials'. Although disappointed by his Lachlan expedition, in not following the river all the way to its end, John Oxley took up Macquarie's next directive to explore the Macquarie River. He departed from Bathurst on 28 May 1818 with an exploration party that comprised Deputy Surveyor General George Evans, Oxley's friend Dr John Harris, a botanist named Charles Frazer, and twelve convict men. The names of the twelve convict men were later recorded by Governor Macquarie in his diary, upon the party's eventual return to Sydney. "The following are their Names: William Warner, Patrick Byrne, James Blake, George Simpson, James Williams, John Williams, Francis Lloyd, Barnard Butler, Thomas Ellis, John Dwyer, Richard Watts, Henry Shippey." He also noted that the first five men listed had also been with Oxley on the previous year's 1817 exploratory journey to the Lachlan. They also took boats with them and nearly two dozen horses. The party would get upriver to the Macquarie Marshes, turn north-east to the Warrumbungle mountains crossing the Castlereagh River in the process, view the rich Liverpool Plains, come across the Peel River and the Hastings River to reach the NSW coast and the site of present day Port Macquarie. These European discoveries delivered a real boost to the NSW colony. On 12 June 1818 Oxley was near the site that would become Dubbo. He wrote that he had passed that day 'over a very beautiful country, thinly wooded and apparently safe from the highest floods...'. they continued to follow the Macquarie River through land that became increasingly flat. On 27 June they spotted a small hill and named it Mt Harris in honour of John Harris accompanying him. On the same day the mountains in the distance to the east (now known by their Aboriginal name, the Warrumbungles) were named Arbuthnot's Ranges for the Rt Hon C. Arbuthnot of H.M. Treasury. Mt Harris is 54 km N-NW of present-day Warren. "But if an opinion may be permitted to be hazarded from actual appearances, mine is decidedly in favour of our being in the immediate vicinity of an inland sea, or lake, most probably a shoal one, and gradually filling up by numerous depositions from the high lands, left by waters which flow into it." From here he retraced steps to Mt Harris, NW of present day Warren, and camped from early July while he sent George Evans forward with a few men to scout a route to the north-east. On Evans' return, the expedition crossed the river that Oxley would name the Castlereagh, went towards the Warrumbungle Mountains, which he named at the time 'Arbuthnot's Range' and easterly through the Gooriananwa Gap From here they moved forward to come upon the rich soil of the Liverpool Plains. On 26 August 1818 they climbed a hill and saw before them rich, fertile land (Peel River), near the present site of Tamworth. Continuing further east they crossed the Great Dividing Range passing by the Apsley Falls on 13 September 1818 which Oxley named the Bathurst Falls. He described it as "one of the most magnificent waterfalls we have seen". Upon reaching the Hastings River the exploring party followed it to its mouth, discovering that it flowed into the sea at a spot which Oxley named Port Macquarie. In his diary of 27 November 1818, Governor Macquarie listed the twelve men who accompanied Oxley and Evans on this expedition (see above). He wrote: "I inspected and spoke to the 12 Men who Accompanied Mr. Oxley on his last Expedition – and in his own presence returned them my thanks for their steady good and obedient Conduct on the Expedition; and being all Convicts I have promised to give them Conditional Pardons as a reward for their good behaviour." In 1823, Governor Brisbane sent Oxley north by boat in search of a site for an alternative penal settlement for the most difficult convicts. On this journey, he discovered the Tweed River and valley and was deeply impressed, recording his impressions as follows: "A deep rich valley clothed with magnificent trees, the beautiful uniformity of which was only interrupted by the turns and windings of the river, which here and there appeared like small lakes. The background was Mt. Warning. The view was altogether beautiful beyond description. The scenery here exceeded anything I have previously seen in Australia." As Surveyor General, Oxley made a close examination of the Tweed River and Port Curtis, and sources connected that investigation, principally the manuscript journal kept by Oxley, and the published Narrative of John Uniack, who accompanied Oxley. Oxley sailed northwards from the Tweed Area in the Mermaid. Rounding Moreton Island, he came across two escaped convicts who had been living with the Aborigines there. With their assistance, he was shown, and named, the Brisbane River. He recommend this place for the site of the convict settlement, which became Moreton Bay, and later the city of Brisbane. A monument was built at North Quay in 1924 to commemorate the site of his landing in Brisbane. He then travelled further north to explore Port Curtis (the site of Gladstone) and continued to explore the region, which is now known as South East Queensland. In 1824 Oxley, accompanied by Allan Cunningham returned to the Brisbane River and, travelling further up, then located the Bremer River. Governor Lachlan Macquarie granted Oxley 600 acres (240 ha) near Camden in 1810, which he increased to 1,000 acres (400 ha) in 1815. He named this property Kirkham and raised and bred sheep there. He was also briefly a director of the Bank of New South Wales. He was one of five members of the original 1824 New South Wales Legislative Council, but was not reappointed when the Council was reconstituted in 1825. "An Inquest was held on Saturday last, on the body of Louisa Oxley, a lovely infant of four years old, that fell into a well 100 feet deep, close under the Hyde Park Barrack wall, and was drowned before aid could be afforded; to which effect a Verdict was returned. The criminality of suffering a well to be so publicly exposed, calls forth appropriate indignation." In August 1822, Oxley married Emma Norton (1798–1885), the youngest sister of the solicitor James Norton. Emma had followed her brother out to New South Wales from Sussex after he had established himself as an attorney in the colony. Oxley and Emma Norton had a daughter and two sons. The elder, John Norton Oxley became a Member of the Legislative Assembly, representing the Western Division of Camden, in the first Parliament after the establishment of responsible government in 1856. He sponsored the Broad Gauge Act which encouraged the use of wagons with broad wheels instead of narrow-tired drays in order to cause less wear on public roads; this measure made him unpopular with the farmers and carriers in his electorate and he lost his seat. The younger son, Henry Oxley, also became a Member of the Legislative Assembly, representing the Electoral district of Camden between 1859 and 1860. Oxley suffered with illness throughout his service, caused by the difficulties of his expeditions. He finally succumbed to his illness and died on 25 May 1828 at his Kirkham property, Kirkham, New South Wales, outside Camden, aged 45. Oxley's statue, from circa 1891, can be found in a niche on the Bridge Street facade of the Department of Lands building, in Sydney. To celebrate the centenary of Oxley's discovery of Brisbane, in 1924 a statue was erected in his honour. 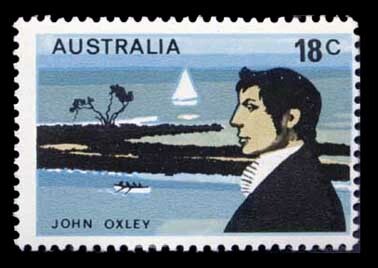 In 1976, Oxley was honoured on a postage stamp bearing his portrait issued by Australia Post. In 2012 a metal silhouette of Oxley was unveiled in Kirkham. John Oxley Village, an on-campus residence of the Charles Sturt University Bathurst campus, colloquially known as "JOV" to students, and birthplace of the Village Fair music festival. Oxley's Plains, on which the Oxley township grew in north-east Victoria, was named by Hume and Hovell after John Oxley during their exploration from the Yass Plains to Port Phillip in 1824. ^ "Family Notices". The Sydney Gazette and New South Wales Advertiser. 28 May 1828. p. 3. Retrieved 4 November 2012 – via National Library of Australia. ^ "To-days's yesterdays". The Courier-Mail. Brisbane. 25 May 1934. p. 12. Retrieved 4 November 2012 – via National Library of Australia. ^ a b c Dunlop, E W. "Oxley, John Joseph William Molesworth (1784–1828)". Australian Dictionary of Biography. Canberra: Australian National University. Retrieved 16 September 2011. ^ Ancestry.com. England, Select Births and Christenings, 1538-1975 [database on-line]. Provo, UT, USA: Ancestry.com Operations, Inc., 2014. ^ "Founders of Brasbane. John Oxley". The Queenslander. 2 June 1923. p. 11. Retrieved 29 April 2012 – via National Library of Australia. ^ Serle, Percival (1949). "Oxley, John". Dictionary of Australian Biography. Sydney: Angus and Robertson. ^ Oxley, John (1820). "Journal of an Expedition in Australia – Part 1". Journals of Two Expeditions into the Interior of New South Wales. John Murray. Archived from the original on 27 March 2018. Retrieved 9 August 2013. ^ Hambleton, Martin "The Story of Australia" published The Sunday Mail, 16 September 1934. ^ "Mr John Joseph William Molesworth Oxley (1785-1828)". Former Members of the Parliament of New South Wales. Retrieved 17 April 2019. ^ NSWBDM index V1813205 7 "Oxley, JENNET to John/ Charlotte"
^ NSWBDM death index 3449/1875 "Oxley, Jeannette, d.o John, Died Woollahra"
^ NSWBDM index V18153503 1A "Oxley, Frances, to John/Charlotte (Thorp)"
^ NSWBDM index 594/1821 V1821594 6 "Oxley, Louisa, to John/Elizabeth (Marmon)"
^ NSWBDM death index, 6272/1824 V18246272 2B "Oxley, Louisa, infant"
^ "Edwards, the notary". The Sydney Gazette And New South Wales Advertiser. 9 December 1824. p. 2. Retrieved 18 April 2019 – via National Library of Australia. ^ "Mr John Norton Oxley (1824-1891)". Former Members of the Parliament of New South Wales. Retrieved 17 April 2019. ^ "Mr Henry Molesworth Oxley (1826-1867)". Former Members of the Parliament of New South Wales. Retrieved 17 April 2019. ^ a b "The Late Mrs Emma Oxley". The Sydney Morning Herald. 18 April 1885. p. 8. Retrieved 17 September 2011 – via National Library of Australia. ^ "Chronological Memoranda". The Sydney Morning Herald. 25 December 1857. p. 8. Retrieved 4 November 2012 – via National Library of Australia. ^ "Statue of John Oxley". Public Art Around the World. GlobeVista. 2007. Archived from the original on 27 November 2012. Retrieved 30 January 2013. ^ "Timeline of State Library of Queensland history". State Library of Queensland. Queensland Government. 2012. Archived from the original on 24 March 2018. Retrieved 30 January 2013. ^ "Image: 0011590.jpg, (378 × 268 px)". australianstamp.com. Archived from the original on 23 September 2015. Retrieved 1 September 2015. ^ "Unveiling of a metal cut-out silhouette of John Oxley". Camden-Narellan Advertiser. Australia. 31 October 2012. Archived from the original on 13 April 2014. Retrieved 30 January 2013. ^ "Accommodation On Campus Bathurst". Charles Sturt University. Johnson, Richard, The Search for the Inland Sea: John Oxley, Explorer, 1783–1828, Melbourne University Press, 2001.